Our RGB Amplifier allows you to increase the overall length of your colour changing RGB LED Strip Lights. 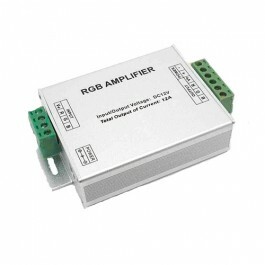 Similar in design to the RF Controller, the RGB Amplifier is easy to install and uses standard terminal block connectors. For each amplifier you purchase you will also require an addition power supply, which is sold seperately. The supply voltage of this product is DC12~24V, never connect to AC220V. Never connect two wires directly in case of short circuit. Lead wire should be connected according to colours that the diagram in the instructions offers. Warranty of this product is one year plus an extra 'suppliers' year giving you a full 2 year warranty. During this period we guarantee replacement or repairing with no charge, but exclude the artificial situation of damaged or overload working. For more information on this product call 0116 321 4121 or email support@ledstriplights.co.uk.